Buy Projectors in NZ. Shop online for the best NZ prices & reviews on Data, PC & Laptop, Multimedia, Home Theatre, Wireless & 3D Projectors. Buy the most popular brands including Acer, Benq, Epson, Sony, ViewSonic & more. Epson EB-S140 3200 Lumen SVGA LCD Projector + FREE Portable Bluetooth Speaker! Epson EB-520 2700 Lumen XGA LCD Projector + FREE Portable Bluetooth Speaker! Epson EB-980W 3800 Lumen WXGA LCD Projector + FREE Portable Bluetooth Speaker! Epson EB-990U 3800 Lumen WUXGA LCD Projector + FREE Portable Bluetooth Speaker! Epson EB-2055 5000 Lumen XGA Wireless LCD Projector + FREE Portable Bluetooth Speaker! Epson EB-535W 3400 Lumen WXGA LCD Network-Capable Projector + FREE Portable Bluetooth Speaker! Epson EB-2155W 5000 Lumen WXGA Wireless LCD Projector + FREE Speaker System! Free Logitech Z213 Speaker System! Epson EB-1795F 3200 Lumen 1080p Full HD Wireless LCD Portable Projector + FREE Speaker System! Epson EB-2265U 5500 Lumen WUXGA LCD Projector + FREE Speaker System! Epson EB-695Wi 3500 Lumen WXGA Ultra Short Throw LCD Projector + FREE Speaker System! Epson EB-1450UI 3800 Lumen WUXGA Interactive LCD Projector + FREE Speaker System! 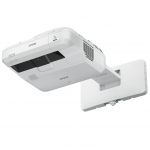 Epson MeetingMate EB-1460Ui 4400 Lumen WUXGA Interactive LCD Ultra Short Throw Projector + FREE Speaker System!